Hannah McQuilkan is a qualified Naturopath, Medical Herbalist, Aromatherapist and Energy Healer with 20 years experience in the wellness industry. She is currently completing her training as a Forest Therapy Guide. 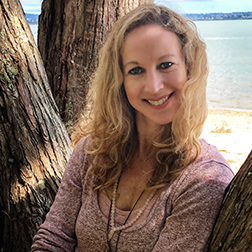 Hannah has been making vibrational essences and remedies using the magic and power of nature for 15 years and sold her own range of vibrational essences throughout New Zealand. Her highly developed intuition allows her to commune with nature, producing co-created products that uplift and benefit the planet.